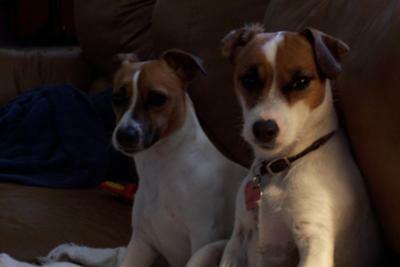 Our Jacks are a year apart in age and as different as two dogs can be. Jesse the older male loves baths and being combed. Kiera the female is the alpha dog! (wearing the heart collar.) She took over the moment she entered our home. Poor Jesse! People always ask how I get the dogs to pose for pictures. You don't get a Jack to pose, you take upwards of 20 pics and hope they stay still for just one!